Race Recap - In his track debut at Auto Club Speedway, Dylan Kwasniewski drove the No. 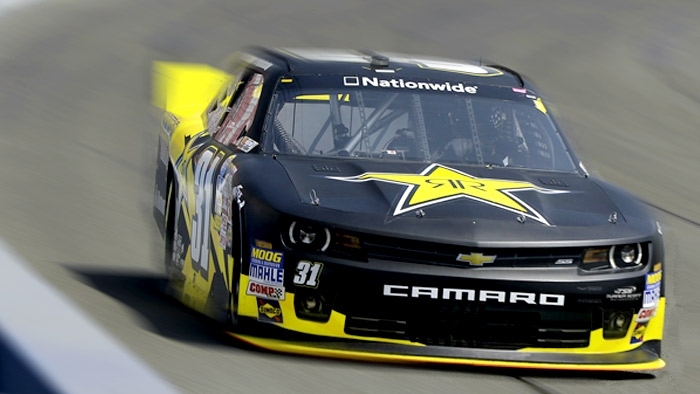 31 Rockstar Energy Chevrolet to an 11th place finish in the NASCAR Nationwide Series race on Saturday afternoon. With speed on their side during the weekend's two practice sessions, the Rookie of the Year contender was able to qualify in 7th position for the start of the TreatMyClot.com 300. After the green flag dropped, Kwasniewski battled a tight race car and found himself in the 15thposition when the first round of green flag pit stops took place. During the stop, crew chief Pat Tryson called Kwasniewski down pit road for four tires, fuel and an air pressure adjustment. Shortly after, Kwasniewski reported that his No. 31 car felt much better and his lap times were a direct reflection of this, as he was running top-5 lap times. Kwasniewski had worked his way up to the 12th position just before the second caution came out in which he came down pit road for a round of adjustments to help free up the Rockstar Energy Chevy. The Las Vegas, Nev. native would restart in the 12thposition and continue to run within the top-15 for the remaining portion of the race, bringing the Rockstar Energy Chevrolet home in the 11th position. "My Turner Scott Motorsports prepared me with another great Rockstar Energy Chevy this weekend. It was fun to get out there and learn my way around Auto Club Speedway. The car had great speed this weekend, we just battled a tight race car at the beginning of the race and that hurt us a little bit. We will take the off weekend coming up to work on a few things and get prepared for Texas in a couple of weeks." About Turner Scott Motorsports: Turner Scott Motorsports was established in 1999 and has become one of the most successful organizations in NASCAR by combining the business acumen and shared passion for racing of co-owners Steve Turner and Harry Scott Jr. This season will mark the fourth season of full-time NASCAR competition for the organization, which expanded in 2011 from a two-truck operation in the NASCAR Camping World Truck Series (NCWTS) to become the largest stand-alone multi-series team in NASCAR's top-tier touring series. The team earned its first championship when James Buescher captured the NCWTS title in 2012. Turner Scott Motorsports operates out of an 110,000 square-foot state-of-the art facility in Mooresville, N.C. The Chevrolet-backed team has created alliances with General Motors' powerhouse team Hendrick Motorsports, which provides engine support for both its NNS and NCWTS programs, and Earnhardt Technology Group for drive train and suspension technology assistance. For more information on Turner Scott Motorsports, visit http://www.TurnerScottMotorsports.com.